When Syd Wyman started putting high-stakes poker players on display just inside the entrance to the Dunes Hotel in 1969, his publicity stunt ended up working a little too well. So many players wanted to play in the game that the casino’s management had to erect several more tables and cordon off the area with a rope. In 1966, Milton Prell finally got it right. He spent $3 million renovating the place and ditched the English theme for an Arabian Nights one. On April 1 of that year, the newly refurbished hotel enjoyed a grand reopening featuring the comedian Jackie Mason and an endless cascade of flower petals dropping from the ceiling. A year later, Elvis Presley married Priscilla Wagner there, a media event which attracted an influx of new customers from all around the world. The bad times seemed to have passed. In 1972, a group led by the local businessman Sam Diamond purchased the property for $5 million and spent an additional $60 million on renovations and new construction, including a “29-story” tower that, in fact, only had 19 floors. It was in the wake of this major overhaul that the biggest poker game in Las Vegas arrived on its doorstep, thanks to Syd Wyman. Besides six-figure pots, the game at the Aladdin will always be remembered for two things. It was here that Major Riddle lost controlling interest of the Dunes. It was also where Tom Abdo, a high-stakes player from Las Vegas who was posthumously inducted into the Poker Hall of Fame in 1982, died in the middle of a game. Abdo stood up from the table and was trying to reach the rope when he had a massive heart attack and hit the ground. According to legend, he said, “Count my chips. I’ll be back,” but he died in the hospital later that day. This game was essentially the same as the one that took place at the Dunes, only bigger. “It was so high some of the locals couldn’t participate in it,” said Addington. That didn’t mean it lacked willing participants. Along with Texas road gamblers such as Doyle Brunson and Crandell Addington, it attracted a steady supply of drop-ins who faithfully pumped money into the game. “It was so well attended that games often ran for days at a time and many fortunes changed hands,” Addington added. 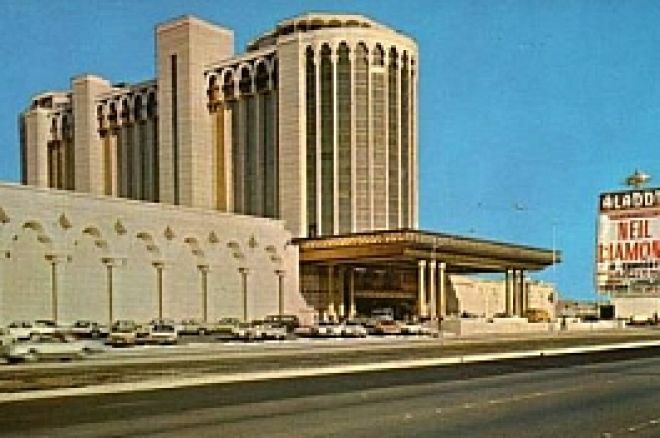 For three years the Aladdin was the center of the poker universe, but after the casino underwent another major overhaul in 1976 the game was abruptly shut down. Johnny Moss, the game’s host, was asked to move it on down the road, a request he must have taken literally, for he merely relocated it to the Flamingo, which was still on the Strip just down the road from the Aladdin. At this point in its history, the game had become its own entity, capable of migrating from one location to the next without very little drop-off in the level of participation. It would continue to move around town, jumping from casino to casino, until 1989, when it finally found a semi-permanent home in the newly opened Mirage Casino. At some point during its travels it also acquired a name that remains with it to this very day — The Big Game.